Heat up the oven to 325 degrees F. Take away neck and giblets and get ready for cooking turkey broth. Sprinkle the turkey with salt, ground black pepper, thyme. Put onions in a pan around the turkey and cover with a foil. Fry the bird for 2 ½ hours. Brush the pears with margarine, thyme, pepper and put them around the turkey. Fry the bird, uncovered, approximately 45 minutes. The turkey’s ready when the temperature of the thermometer reaches 165 degrees F. Put the pears and onions on the big plate. Take the turkey from frying pan, tilt slightly to let the juices run into pan. Transfer turkey to the plate with pears and onions. Add water to juices in pan. Set pan over 2 burners and prepare on medium-high, whisking till browned bits are loosened from bottom of pan, throw out fat. 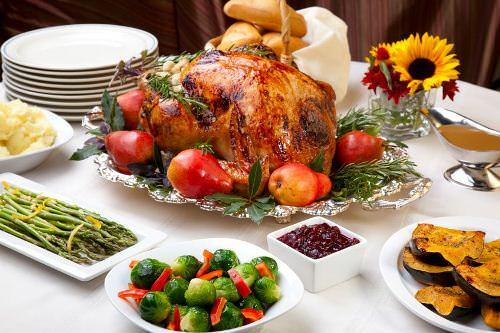 Serve the turkey with onions, pan juices and pears.